How do I set up the gear indicator on the DASH2 PRO? The gear indicator on the DASH2 PRO can be set up to calculate gearing from engine and vehicle speed or to read the value from a sensor channel. The sensor can be either connected directly to the DASH2 PRO or the value can be read from the serial or CAN bus. 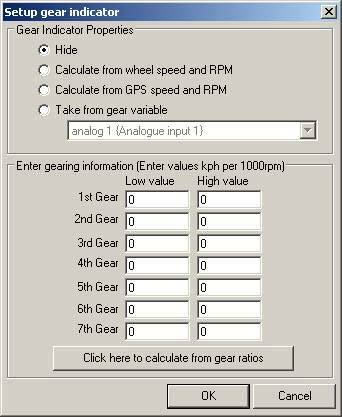 Open the DASH2 PRO configuration software and click on the Setup Gear Indicator icon. Select the method to be used for the data, if the data is to come from a sensor then the values in the table are the upper and lower limits for the sensor readings. For more detailed information on this go here.